Hi foodies. Welcome to AYESHA'S KITCHEN. 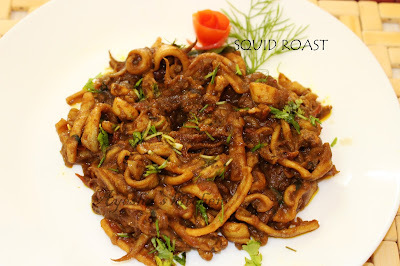 Here is the recipe of a lip smacking, delicious squid dish / calamari recipe and no words to say ..its really yummy with a drooling flavor. 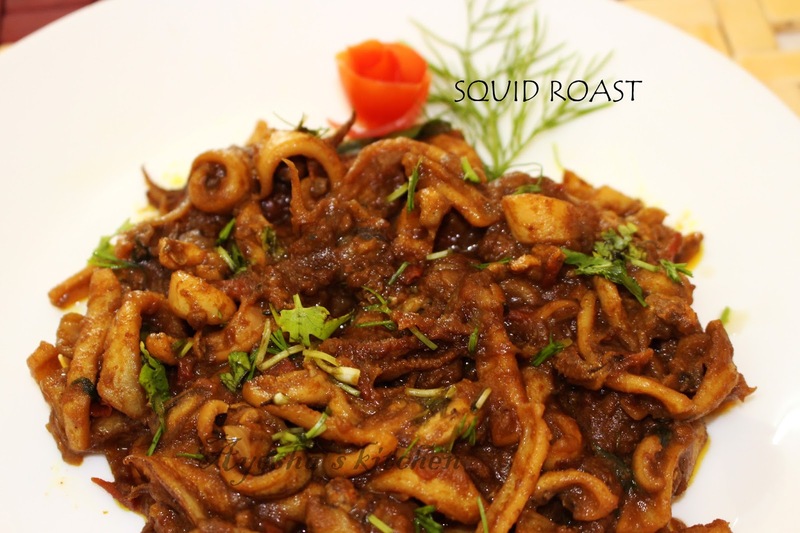 Squid roast is one of the all time sea food delicacy. It is called as kanava roast / koonthal roast in Kerala. The flavor of this awesome fried calamari recipe itself makes your tummy happy. Try this easy, traditional recipe for fried calamari / squid roast and am sure you will crave for more. Here is the recipe for roasted calamari / squid dishes / kerala cuisine / Indian fish recipes / seafood recipes. Clean the squid and cut into thin long strips and keep it aside. Now take a big bowl and mix in chopped tomato, ginger garlic paste, turmeric powder, chili powder, coriander powder, salt and curry leaves. Crush well with your hand and make a thick gravy. Now add the squid to it and mix well. Cook well until the gravy becomes thick. No need of adding water. If too dry, add few tbsp of water only. Now heat a pan and pour 4 tbsp of oil(preferably coconut oil). When hot, add chopped shallots along with green chili and saute till done. When done, put the squid masala to it and mix well. Check for salt. Allow it to cook for few minutes or till oil separates.